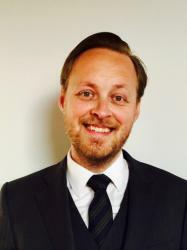 Jacques Hartmann is Lecturer in Law, Dundee Law School, Scotland. On 28 November last year Canada and the Kingdom of Denmark announced that they had reached a tentative agreement on the maritime boundary in the Lincoln Sea. The Lincoln Sea is a body of water bordering the Arctic Ocean, north of Canada’s Ellesmere Island and Greenland, which, together with the Faeroe Islands, is part of the Kingdom of Denmark. 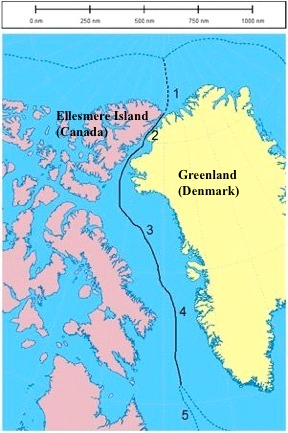 The Canadian/Danish agreement partly settles long-standing uncertainty over the northern boundary between the two countries, but it does not settle the dispute over Hans Island which is situated right in the middle of a potentially important sea route to the Arctic Ocean. This graphic is for illustrative purposes only. The solid black line is the boundary agreed in the 1973 treaty. The broken black line is the boundary agreed ad referendum. The broken blue lines indicate 200-nautical-mile zones. Although that treaty officially concerned the continental shelf, both Canada and Denmark have used the delimitation line to define fishing zones. Thus by usage it is had become a maritime boundary. The 1973 delimitation treaty lists 127 points from the Davis Strait in the south to the Nares Strait (also know as Robson Channel) in the north, the narrow strait of water between the northernmost part of Ellesmere Island and Greenland. That treaty established a boundary of nearly 1,500 nautical miles. At the time, it was the longest shelf boundary ever negotiated. The new agreement extends the boundary to more than 1,600 nautical miles. Most of the boundary follows a median line extending 200 nautical miles from the respective coasts. This was not possible in the Nares Strait and Kane Basin, the northernmost part of the boundary, due to the proximity of Ellesmere Island to Greenland. In fact, the two islands are so close that when Canada extended its territorial sea from 3 to 12 nautical miles in 1972, it went beyond the median line with Greenland. The northernmost part of the delimitation line was therefore settled by negotiation. No agreement was reached with regard to the Lincoln Sea. Instead, the 1973 treaty stated that ‘for the time being the Parties have not deemed it necessary to draw the dividing line further north than point No. 127’. It was later agreed that the boundary in the Lincoln Sea should be an equidistance line, but there was disagreement on technical aspects of how the line should be drawn. The new agreement settles these technical aspects and solves a disagreement that has existed since the 1970s concerning a small area of approximately 65 square nautical miles. According to the information released, the new agreement will provide an opportunity to modernize the provisions in the 1973 treaty and to complete a process of technical adjustments to the coordinates of the existing boundary. Amendments were already made in 2004 and further technical adjustments occurred to the southern part of the boundary in Baffin Bay and Davis Strait in 2009. More recently experts have completed work for Nares Strait. Experts from both countries have also been working together collecting data for the extension of the continental shelf boundary beyond 200 nautical miles. Although neither Canada nor Denmark has yet made a submission to the Commission on the Limits of the Continental Shelf (discussed by Douglas here) concerning the Arctic Ocean, it is likely that they will do so in the near future (for Canada the deadline is November 2013 and Denmark November 2014). Assuming that the Commission accepts that each has a continental shelf in the Arctic beyond 200 nautical miles, the delimitation of a boundary between the continental shelves will be necessary. For now, the new agreement means that the boundary between Canada and Greenland is almost complete, except for a 1,2 kilometer gap between point 122 and 123. The reason for the gap is a small barren knoll with the name of Hans Island. Sovereignty over the island has long been disputed and the 1973 delimitation line stops on each side of the low-water mark of the island. Hans Island is uninhabited and has no known deposits of oil or other raw materials, but it is situated right in the middle of a potentially important sea route. The continued melting of ice in the Arctic Ocean is expected to result in the opening (at least during parts of the year) of the Northwest Passage. However, as the agreed delimitation line seemingly leaves the island without any territorial waters, sovereignty over the island has no effect on the legal control of navigation in the strait. Thus it is difficult to find a rational explanation for the longstanding dispute over the island, other than national pride. As the island is uninhabited, neither Canada nor Denmark can claim it on the basis of historical occupation. There are no known treaties explicitly mentioning the island, nor is the principle of uti possidetis applicable. Canada bases its claim on its acquisition of Britain’s Arctic territories, by the British Adjacent Territories Order of 1880. But the British did not discover the island. The first reference to ‘Hans Island’ appears in the Narrative of the North Polar expedition (p. 407) from 1872. The expedition was led by Captain C.F. Hall, an American. The island was named after Hans Hendrik, a Greenlandic Inuit who was a member of Hall’s expedition. The United States claimed part of northern Greenland until 1917. The claim was relinquished as part of a transfer agreement concerning the Danish West Indies, now the United States Virgin Islands. Recently, there have been reports that the island may be split down the middle. A friendly solution would be preferable to a ‘scramble’ for the Artic. The practice of using State forces to display ‘effective control’ over uninhabited islands is worrying. This is one area where international law does not seem to secure international peace and security, but rather the opposite. Canada and Denmark would do well establishing a positive example for other States to follow.